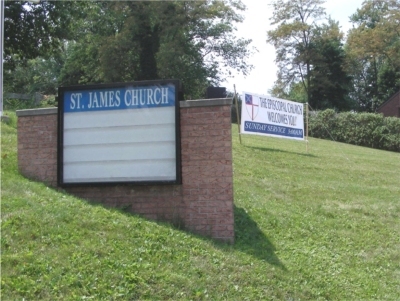 I attended a planning meeting at St. James’, Penn Hills, on Wednesday. This, remember, is the property recently vacated by an Anglican Diocese of Pittsburgh congregation. (See “St. James’ Episcopal Church Returns.”) As I rounded the curve on Frankstown Road, I saw not only the noncommittal “St. James Church” sign but also a new “The Episcopal Church Welcomes You” banner with foot-high letters. 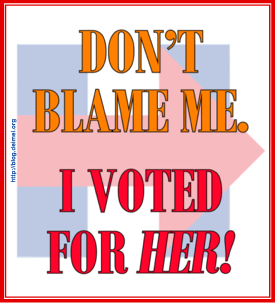 (Click on the picture below for a bigger view.) Note that I will refer to the church as “St. James’ Episcopal Church,” though there seems to be some ambiguity about the need for the apostrophe. In a recent story on the Episcopal Diocese of Pittsburgh Web site, the church’s name appeared both with and without the apostrophe. As it happens, a group of people had been praying for and planning for an Episcopal future for St. James’ for some time. (The “Anglican” congregation that had become part of Bob Duncan’s schismatic diocese had long been rumored to be a failing enterprise unable to maintain the property. Those people turned over the keys declaring that the negotiating ground rules for parish property set down by the Episcopal Diocese of Pittsburgh were unacceptable.) The Episcopal planners-in-waiting began their work praying on the lawn even before they gained access to the building. Now they are meeting every Wednesday to help make St. James’ into whatever it is about to become. Bishop Ken Price has entrusted the Rev. Vicente Santiago to reëstablish an Episcopal congregation on the St. James’ property. Vicente led the Wednesday meeting, which comprised about a dozen people, both lay and clergy. The participants were Episcopalians, non-Episcopalians, and Episcopalians-to-be. I knew about half the people there. I was there to see what was happening and to help figure out the sound system in the church, a task I tackled after the meeting was over. The most bizarre story told at the meeting involved a very large cross that had been located behind the altar and that had been removed before the first Episcopal service earlier this month. The cross, which was not unattractive, would be appropriate for a church ten times the size of St. James’. In a small parish church, however, it must have simply been intimidating. Apparently, members of the departed congregation complained to Bishop Price about the removal of the cross. I cannot imagine why they thought they had standing to make such a complaint! I had several times heard Vicente speak of establishing a healing ministry at St. James’, but I was unsure just what that meant. The meeting gave me a better sense of what he had in mind. Although St. James’ had had but a tiny congregation before it was turned over to the Episcopal diocese, a number of outside groups were meeting there. Nearly a dozen 12-step groups met in the building and are continuing to do so. Whereas members of these groups seem to have had a somewhat tense relationship with their former landlord, they are being welcomed as partners-in-mission by the Episcopalians. They are helping to spruce up the place and have developed a new sense of belonging at St. James’. People from other denominations have been dropping by St. James’ from time to time to see what is going on, and there may be ecumenical partnerships that develop there. The building has a good deal of space, after all, and it can accommodate more activities than it is presently. One participant in the meeting articulated a vision of a mission of “hospitality, healing, and recovery” for St. James’. I found all this a little surprising. St. James’ is, in a real sense, a church plant, though it has a head start in having an appropriate building at the very beginning. Usually, however, one imagines building a congregation and then developing mission projects for the congregation. In a sense, St. James’ has already found its mission, and its congregation is being built from members of the community who happen by and by those people already using the facility who see a willingness to welcome all God’s children. St. James’ has the potential to become a very exciting place. I am happy to see St James['] finally becoming a welcoming parish. I once lived in Penn Hills, about 7 minutes from the door. St James was my local polling place. But, it never crossed my mind to worship there. There was at least one other parish, 15 minutes from my door, that was more hopitable. I will pray for their vocation and mission, and wish them success. The apostrophe indicates that a church is under the patronage (or matronage) of its titular saint. Certainly, that is the usual Episcopal Church convention. The Roman Catholics just use the name (e.g., St. James Church). I don’t know if this implies a different ecclesiastical/theological understanding. Following Strunk and White, it would be either "St. James Episcopal Church" or "St. James's Episcopal Church"--but not "St. James' Episcopal Church." I'd prefer the more complete attribution, "The Episcopal Church of St. James the Great, Apostle and Martyr." Possessives of words ending in s sometimes add ’s and sometimes add simply ’. I have never seen St. James’s used, and no one in Pittsburgh seems to add the extra syllable that St. James’s would require. I would point out that the possessive of Jesus appears on three pages of the BCP, always as Jesus’ (see pages 110, 139, and 850). The Chicago Manual of Style (14th ed. ; I don't have anything more recent) supports Strunk and White. It should be James's. Vincente is a former long-time member of Truro Church in Fairfax. Interesting to see him put in charge of this congregation, perhaps a recognition by the bishop of the renewal roots in the Diocese of Pittsburgh. When Vincente speaks of healing ministry it is possible this is coming from the prayer and praise traditions in the Episcopal charismatic renewal. The charismatic renewal made a significant impact on both the Diocese of Pittsburgh and the Diocese of Virginia.